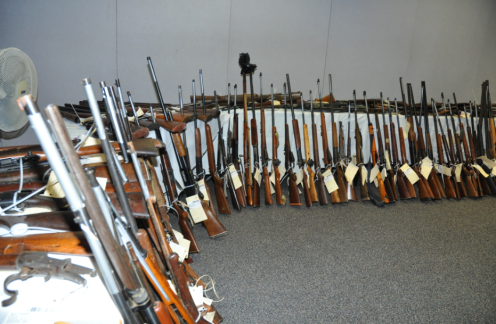 In 2014 and 2015, the Waterloo Region Police Service seized over 300 weapons and 14,000 rounds of ammunition from citizens voluntarily giving them up through the gun amnesty program. The program that takes place during a one month period aids anyone that has unwanted weapons, illegally possessed or otherwise, by allowing them to be handed over to police officers without fear of repercussions. The gun amnesty program is back after a one-year hiatus and this time around they expect to see 150 to 200 weapons turned in over the month of November. By noon on the first day of the program the police service had already received four calls inquiring about disposing of their weapons, including one call about a collection of swords. The police say they are aware the likelihood of a criminal actually turning in a gun is slim, but the month of gun amnesty allows anyone who has found themselves in a “sticky situation” to turn in weapons they may have permit issues with or inherited and don’t want to deal with anymore. According to the WRPS, they have no way of being able to truly know if the program has had a positive effect on the community but in their experience when they catch a criminal using a firearm in a criminal offence, most of the time that firearm was gained “as a result of a break and enter.” In their view if they can eliminate unwanted firearms, that will suppress the odds of it ending up in the hands of a criminal. Dedicating one month to the amnesty allows the police service to designate the appropriate resources and encourage those in possession to come forward when this special opportunity arises. Anyone with a desire to cast aside unwanted weapons is asked to call (519) 570-9777 to make arrangements for an officer to pick up the items. The police service makes it extremely clear that they do not want civilians delivering weapons to the police station in person.